Ever since I gave up my job in 2009 to do my MSc in Holistic Science at Schumacher College my life has been pretty crazy. Right now I am reminded of John Lennon’s quote along the lines of “life is what happens to you in between your plans”. Having misunderstood the rules around Brasil’s visas, I now find myself back in the UK until May, an ocean apart from my beautiful fiancé who is still in Brazil. 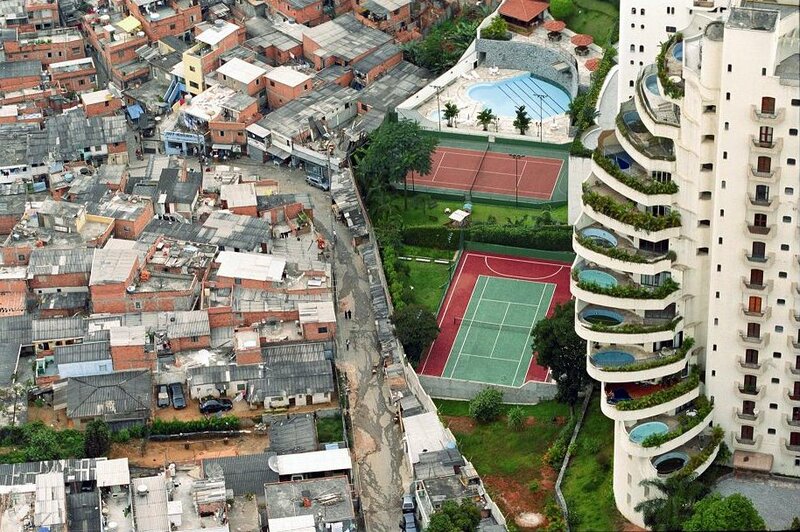 But before I had to leave, a few weeks ago I attended a talk in Brazil by Julio Bin, who had been speaking about sustainability in Brazil, and he showed these two dramatic pictures of São Paulo, one of the pollution, and the other of the extreme inequality of wealth, which in São Paulo often exists side by side, in the sprawling and unplanned metropolis. It has been extremely challenging for me living in São Paulo, one of the worst polluted cities in the world, when I come from one of Scotland’s least populated and agricultural regions, Dumfries and Galloway. I am very much an outdoors type of person, loving mountain biking and well, embracing the elements and fresh air, and when people from São Paulo ask you how much you are loving their city, for they are extremely proud of their city and never seem to ask how you are coping or dealing with it, it can be hard to know what to answer. But while I was there, rather than being so down about the negatives, I made an effort to re-establish a sense of place for myself. What do I mean by a sense of place? Well this is something I will be writing a lot about, but for me it was about me being at ease in São Paulo, making peace with the insanity of the traffic, the noise, the pollution, the fears of security, the corruption, and trying to really get São Paulo, or at least keep myself open enough to be receptive to what it has to offer, be open and receptive to all who I met there, and try and connect with the soul of São Paulo. I can not say I really achieved this while I was there, but it has given me so much to think about. Something struck me as I went to the local tourist information office to see what local events were happening. I ended up with a few leaflets, pretty much all of which were about the local natural habitat, the forest parks, the nature reserves and what the Royal Society for the Protection of Birds calls Dumfries and Galloway’s “Hidden Jewels”. Reading these leaflets I realised that I simply had not taken in just how much diverse and beautiful wildlife there is back home, and how I had not come close to fully appreciating what we have here. 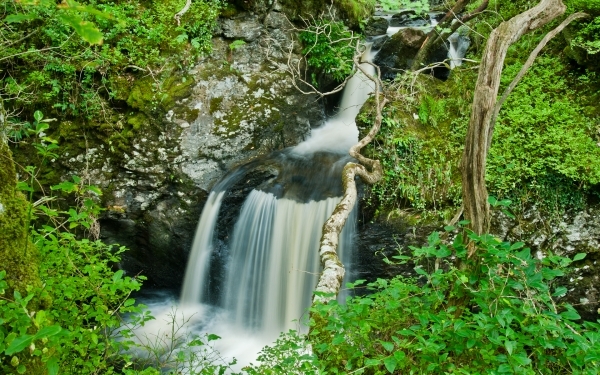 Here are just a few images from Dumfries and Galloway, tucked away in the south west corner of Scotland. I realise that this may seem like a strange little blog, but I think for now I just wanted to drop a little “meme” into my blog, and that is this concept of a “sense of place” without really defining it. It is more an invitation to ask you what is your sense of place? have you thought about it and what does this phrase invite you to start thinking about. Given my own schizophrenic existence, I have been thinking about this a lot! Just before I finish, in the name of fairness I should say that Dumfries has many of its own problems. There is high unemployment, drug problems, and currently there is a new development of houses and leisure facilities which is threatening the town’s nature reserve. However, the contrast with São Paulo was more one of urban living and disconnection with nature. Everywhere in the world has problems and issues right now, but with a transition of consciousness we can help turn things around ! What I look for to give me a sense of place is the capacity of the people and structures around me to give me the freedom of movement and thought to dispense with the usual drudge of cultural paranoia. It seems like you’re really missing home. I wonder if Dora will go to UK to meet you, or if you’ll get back and discover other (of the many) faces of Brazil. Have a nice trip, enjoy home, and be back soon – perhaps to visit Belo Horizonte, Chapada Diamantina, Parati and other charming local places with Dora. I lived in BH for a few months last year and although it was far too big for me at least you could see mountains : ) I guess though that there is quite a different social and business mindset in BH which is quite interesting to observe. One problem we have is not having a car and so that meant not leaving SP at the weekend as many people did – although again most people had a hard time with me not being interested in going to a beach – I just burn! I am well aware of all the amazing natural places in Brazil, but you need budget to either fly or travel to these places and that I didn’t have. I do though in my teaching talk about “sensing” and I wonder if many people who live in SP just do not see the pollution when not having their attention drawn to it. I do wonder about Goethe’s approach to perception and how this would maybe change the thinking of people living there. It is true, I do miss home but then Brazil has so much to offer it is untrue – it is a continent and more than a country! It really is, but I am sure I do not appreciate it enough and also as I said Dumfries as a town certainly has its own set of problems to deal with! I will be writing more about some interesting things here over the next few months as this is where I am now based for a while.